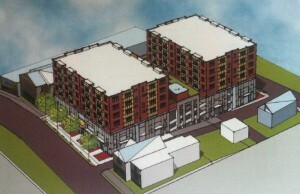 An architectual rendering of the proposed Union Place development in Downingtown on East Lancaster Avenue. The development would include 81 public parking spaces, 72 apartments and four retail locations. 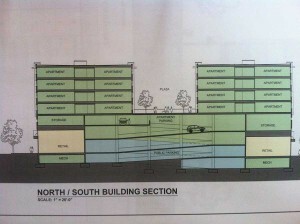 DOWNINGTOWN — The borough’s request for bids to build a parking garage for additional downtown parking for the lot at 150-170 East Lancaster Avenue prompted a proposal not just for a parking garage, but 72 upscale apartments and four new retail spaces under a plan revealed during Wednesday night’s Borough Council meeting. Tripoint Properties is proposing building the seven-story development — Union Place — with 171 parking parking spaces, 83 of which would be for public use, the rest for the residents and the retail uses, four new ground level retail spaces and 72 one and two-bedroom apartments on the site. Although the Borough Council has not made any decisions as to whether to accept the bid, the initial response from borough officials was positive. This rendering shows the proposed layout for Union Place, with apartments on the top floors of the seven story structure, and parking and retail below. “This project fits our goal of making Downingtown a more modern community while protecting the culture that has made Downingtown special for generations,” Mayor Josh Maxwell said. Maxwell said he sees the project as potentially having benefits for the entire community, from existing merchants downtown, to taxpayers who would see expanded parking for shopping at no additional costs to the borough. Just moved into Downingtown and I LOVE THIS PROJECT!! !